I bought a new graphics card this week, since new games require more graphics juice than the old one could provide. I can now start Arkham Knight. (It still crashes regularly, so I’m waiting for the next patch.) I’ve also been replaying old games to see if the graphics are better. 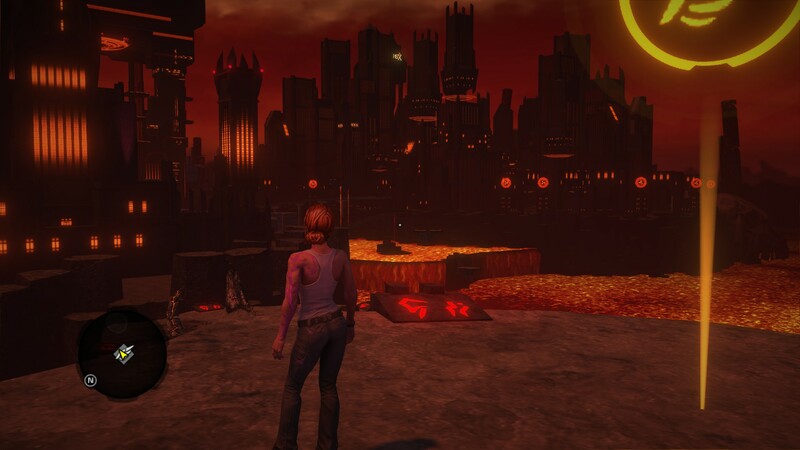 I got to playing Saints Row IV, and then thought, why not do more of the same and pick up Gat out of Hell? Rock Paper Shotgun recently anointed SR4 as the best action game ever. I’d put Arkham City first, personally, but SR4 is pretty close to the top. It’s fun, reasonably challenging, completely unserious, and yet has a certain unexpected heart. It’s one of the few games where the protagonist’s companions really start to feel like her friends. The setup of Gat is simple: ill-advisedly playing with Aleister Crowley’s Ouija board, the Boss (aka the President of the US) gets taken to Hell where Satan wants to marry her to his daughter. (The game imports your SR4 save so you get your own Boss. Satan doesn’t seem to notice or care that the Boss is female.) 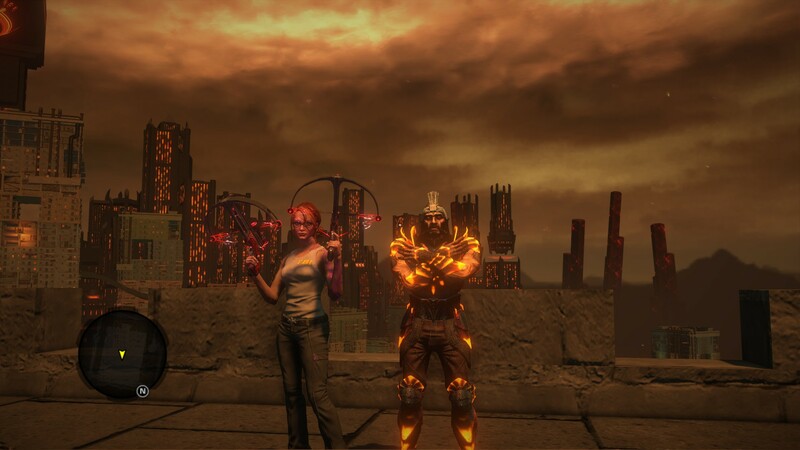 Then Johnny Gat and Kinzie Kensington jump into Hell to save her. Amusing bit: Gat convinces the Ouija board to make a portal by shooting it. The overall mechanics are the same as SR4. You get superpowers, the NPCs give you missions. You can drive the battered-up cars if you like, but you won’t because you can fly. At least they didn’t bring back Steelport– “New Hades” is a new town. The imagined urban hell is fun. Damned souls– husks– wander the streets, naked but sexless, moaning, or drive around endlessly. There’s one on a stripper pole. The most amusing conceit is that some enterprising damned souls have made their own little fiefdoms, most importantly Dane, who was the evil CEO of Ultor in Saints Row 2, but also Vlad the Impaler, Blackbeard, and William Shakespeare. (He sold his soul to the devil to be good at writing, you see.) These become your allies against Satan. As in most pop culture, traditional theology is mined for ideas with no attempt to take it seriously… this is Hell like the Saints are an investigative report on street gangs. The best part of the game is the flight power. It’s like SR4’s gliding power but not quite, the most important difference being that you can steer up and down using the mouse. It took me a bit to get used to it, and then I loved it. Zipping around Hell’s airspace is a lot of fun, and there are special side missions that concentrate on it. The challenge level is variable. I got really frustrated with the rescue missions you get at one point. But after leveling up some more I got a gun called the Gallows Dodger, which basically makes all fights cake. You can play either Gat or Kinzie. The creators have a weird belief that Gat is their best character. They took this lightly in SR3 (the giant Gat heads were hilarious), while they made a huge thing about him in SR4– although the other characters had become interesting and quirky enough that Gat fell flat. I think it’s great that their ultimate badass is Asian-American… but I played as Kinzie, who’s a lot more fun. It’s just a pity that for cutscenes and for the climax, they go back to Gat. It also feels very un-Saints Row to be playing a character you can’t change. There aren’t even any stores, so you can’t dress Kinzie or Gat up or give them a tattoo. They have the technology, so it’s not like they saved a lot of work. The game is short– it took me just 11 hours– but at least it’s less than half the (original) cost of SR4. All in all: if you liked SR4, you will like this. Just don’t think of it as a completely new thing, or it will seem like a trifle, too much like the original. Think of it as fancy DLC– better, in fact, than any of the actual SR4 DLC.